“Due to the present ongoing problems in Israel with all the recent shootings and people getting kicked to death in public etc, the band do not feel safe or secure with the idea of playing Tel Aviv, and as the ticket sales are also not very good I think it is in everybody’s best interests that we cancel the show now. Thank you for your understanding and I am sorry that it did not work out”. That’s how Manfred Mann’s Earth Band cancelled their Israeli gig, scheduled for January 19th in Tel Aviv’s Reading-3 club. The security issue angered Israeli ticket buyers, who felt cheated and humiliated. The show was originally scheduled for September 21st, 2015. 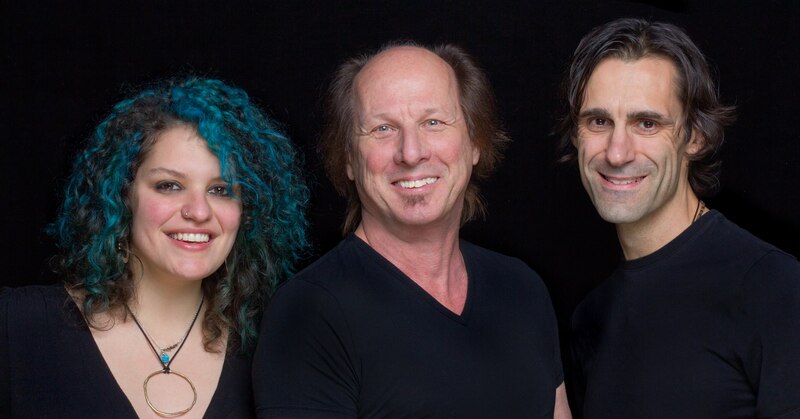 Although the band has informed the Israeli promoter on November 3rd, the show only was officially cancelled in the last minute by the Israel production, citing difficulties with locating a proper Organ for famed keyboardist Manfred Mann. Ticket buyers were suspicious about the whole thing, but a new date was set (19/01/2016) and things looked fine. However, the Israeli promoter, “Progstage”, refused to accept the situation. A wave of terror has swept Israel since September 2015, centering around the Temple Mount. The guys at ProgStage did not cancel the gig, and kept on selling tickets to Israeli consumers. After this annoucement, the Israeli promotor had no option but to cancel. However, this is where things got ugly. Progstage staff accused Manfred Mann’s management of joining a cultural boycott against Israel (BDS). This, despite the band’s sweeping denial of any such attempt. It should be noted that Manfred Mann’s Earth Band has performed in Israel on May 2004. The band gave two gigs in Tel Aviv and Haifa. So clearly, at least some of the band members what Israel is like. After the Israeli press turned the lost gig into a minor political scandal, the summary is quite simple: many UK artists don’t feel safe in Israel. They watch BBC News and see an endless stream of terror attacks throughout Israel, including the occupied territories. People are being stabbed in the streets of Jerusalem, Hebron and many more cities. Many Palestinians are being shot to death by soldiers, sometimes on a daily basis. Justin Hayward (for The Moody Blues), for example, also cancelled his Tel Aviv gig after two attemps of rescheduling. 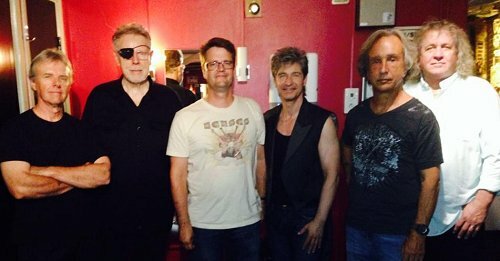 American band “Kansas” also cancelled their gig back in August 2014, because of the war with Gaza. We, Israelis, understand why some rock groups decide to avoid visiting Israel. However, it should be noted that many big rock bands have perfomed successfully in Israel lately. Bon Jovi, Art Garfunkel, Suede and the Rolling Stones are just some of the artists who ignored the security concerns. Even the great Elton John is scheduled to perform in Tel Aviv’s Hayarkon Park on May 26th, 2016. The Endless River, the 15th studio album by Pink Floyd, is a predictable disappointment. There are no great songs, no flashes of brilliance, no musical surprises and there is nothing exciting for PF fans. We did not have “High Hopes” anyway, since the actual band broke up 20 years ago. Loyal fans of the British ensemble, adoring the guys for almost 50 years, did not really expect to receive an old-new album such as this money-making concoction. “The Endless river” is said to be a “tribute” to the late keyboardist Richard Wright, though it’s not at all clear that Wright, a fairly critical chap, would have expressed great satisfaction from the final result, had he been alive and kicking today. It’s more of a tribute to their record company. How can leftover jam-session pieces made in 1993 for the Division Bell album, released way back in 1994, compete with the great works of the majestic Pink Floyd? It’s sad to say, but there is no competition with the ‘golden age’ of Floyd. The truth is, it takes a superhuman effort to put together something worthy of brain-ear intercation, from over 20 hours of useless studio jam sessions. David Gilmour and Nick Mason had to recruit a team of musical producers and tech wizards, add new solos, throw in a mass of digital studio effects and try to build a consistent product, on par with the band’s perfect sonic reputation. But when time comes for the bottom line, “The Endless River” is nothing more than an elegant anesthetic for aging fans, which have become comfortably numb. The album opens the voice of Richard Wright, the now-missing member, which says, ‘certainly we had an unspoken understanding’, and “There are many things that are left unsaid”. Gilmore adds its own statement, “Sometimes we fight, argue, and then work it out’, or something to that effect. Combining interviews at the opening of an album is an old trick from 1973 (‘ Dark Side Of The Moon ‘), offered by none other than Roger Waters. After a brief reunion with Waters in 2005, millions of Floyd-heads had renewed hope for a renaissance. The irritating Roger is missed (How I Wish you Were Here), at least those who think some political criticism is not the end of the world. The direction of the endless cruise is highly ‘Ambient‘ (perhaps far too ambient), almost like a nostalgic fantasy filled with flashbacks, daydreams and perhaps some kind of polite longing for a gray and shy person. This is not the first time the Floyds mourn a lost band member. But unlike the grand lamentations about the colorful Syd Barrett, here it feels like browsing an old family album, with all the photos in black and white, faded, almost lifeless. Throughout the album you can feel an attempt to recover and recycle great moments from classical albums like ‘Wish You Were Here’, ‘Animals’, ‘The Dark Side of the Moon’ and even some “The Wall” (“Alons-Y” sounds like a reproduction of “Run Like Hell”). Sometimes this is done in a gentle and implicit manner, and sometimes a little more blunt. The opening of “Anisina”, for example, sounds like “Us and Them” from The Dark Side, and Gilad Atzmon’s saxophone only strengthens the resemblance. The short track ‘Skins’ quotes the famous Tom-tom drums of “Time”. ‘It’s What We do’ sounds just like the final moments of ‘Shine on You Crazy Diamond’. “On Noodle Street” is elevator music, and ‘Calling’ can be a subsection of a soundtrack to a quite-pale documentary film about the Amazon river. Naturally, the slow and ambient atmosphere is reminiscent of the less-than-dramatic sections from “The Division Bell“; But the music here, which is in fact just sleepy improvisations on the same three or four chords, is far less ambitious; In the absence of any meaningful text or true concept, they have no artistic direction, musical statement and lyrical depth. Some tracks are just too damn brief to be memorable at all. And above all, quite a few minutes sound too much like ‘On An Island’, Gilmour’s quite-nice solo attempt from 2006, which was far better-flowing than this mundane river. Two tracks stand out from the ambience: “It’s What We Do“, and the only straight song, “Louder Than Words“. Polly Samson’s text is neo-kitsch, self-flattering and not very bright. Gilmour’s lovely guitar still sounds good here, with Mason and Wright giving the respectable guitarist all the space he needs for the right “take”. Bass roles, reserved in the past for Mr. Roger Waters, are now scattered between Gilmour, Guy Pratt, Bob Ezrin and Andy Jackson. It is never pleasant to say negative things about a Pink Floyd album. Sometimes this ‘dirty work’ just has to be done, if you really love someone. 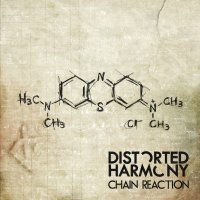 Ironically, the new album actually highlights the greatness of the band at its peak, especially in the years 1973-1979. Even a hollow album like “The Division Bell” suddenly sounds so consistent, enjoyable and even inspiring, compared with the collection of meaningless glimpses. 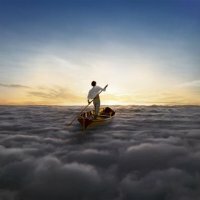 This endless river noq easily inherits 1987’s “A Momentary Lapse of Reason” disaster as the worst Pink Floyd album ever. What motivated this negligible release? contractual obligations, an attempt to promote the back catalog (endless stream of 5.1 remasters), a new cashflow to the Wright family (note Wright’s name in the credits, again and again), or maybe even silencing the fans who demanded one last PF product. Perhaps we will never know what was behind the decision of David Gilmour to pull out the old tapes, sit patiently by the computer and the team of produers, and pretend that Pink Floyd is not just a company (corporation) with limited liability established in 1987, but also an artistic entity with a noble cause. The ultimate test of any music album is the number of repeated listens. The Endless River does not arouse any desire to continue to listen to it in the future. It’s not because it sounds amateurish or ostentatiously embarrassing, not because the music does not sound “Floydish”. Luckily, though, there are at least 14 other good albums to choose from. Conclusion: The Endless River is not a river you want to cruise in. The fountain of inspiration has dried out, long ago. A tribute to the late Richard Wright was not necessary at all. Every note in this album has already appeared in better form and context, inside past albmus made by the glorious Waters, Gilmour, Mason & Wright. Therefore, young listeners are cautioned not to start the introduction to Pink Floyd with this strange product. 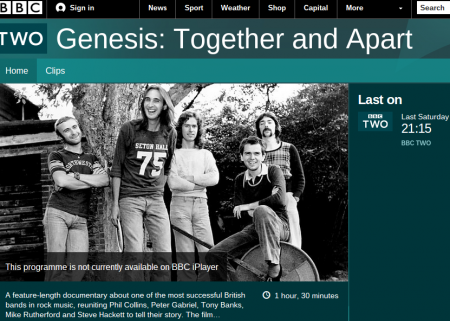 It’s very hard to say anything new about the Genesis story, and the BBC’s latest attempt, “Together and Apart“, which aired in the UK on October 4th (2014) was a failure at that point. Not only was it superficial, but it collapsed under its own weighty mission: to cover not only the band’s life-work, but to touch on multiple solo projects of band members. The result was a mildly entertaining, but not very satisfactory, piece of public relations work, hiding behind the respectable cloak of “documentary” artisan-ship, and spanning only 90 minutes. Genesis band members have interviewed themselves to death over the years. Their CD and DVD boxes were filled with extensive talking-head bits, describing in detail practically every album and song made by the band over their super-long history (1967-2007). It would take more than 3 hours of video to handle this project with any level of respect. At least 2 hours for the band and 1 hour for the solo albums. Peter Gabriel’s work is, perhaps, the most influential. Not only has Gabriel’s music opened the doors for the world-music genre, but his political involvement justifies much more attention than BBC-2 was willing to give. Besides the five band members, the film included exactly 20 interviewees, some of them from outside the band’s professional circle, with less interesting stories to contribute. Jonathan King – first producer for Genesis. His prison sentence wasn’t mentioned, perhaps in exchange for his willingness to participate in the film. John Silver – 2nd Genesis drummer. Just like Stewart, he wasn’t interviewed or mentioned. John Mayhew – 3rd Genesis drummer. As you’ve guessed, wasn’t interviewed or mentioned. John Anthony – producer for the Trespass album. Totally ignored. Paul Whitehead – artist for early Genesis albums. Didn’t make it to BBC’s final cut. Anthony Phillips – his solo work wasn’t covered in any way. King Crimson – huge influence on Genesis. Not a word in the docu. The Nice – direct influence on “The Knife” epic piece. BBC viewers will not know that. John Burns – producer for three early Genesis albums. Not in film. Tony Stratton-Smith (“Strat”) – Charisma label for Genesis. The band’s real patron and godfather. He’s dead, but wasn’t included even through archive pieces. Jill Moore – first wife of Peter Gabriel. Critical to “The Lamb” period, photographed but not interviewed. Brand-X – Jazz-Fusion group, side-project for Phil Collins in the 70’s. No real mention of the albums, band members or significance. Bill Bruford – hired drummer for late 70’s Genesis tour. Not mentioned. Steve Hackett’s solo career – not included at all. Perhaps the biggest flaw in the film. Hackett is furious over this. Maybe the longer DVD version will fix that. Milton Keynes Bowl reunion concert (1982) – important gig for the five. Not a trace. Nick Davis – producer for We Can’t Dance. Wasn’t on BBC. Ray Wilson – new singer after Phil Collins left in 1996. A huge miss for the film. Calling All Stations – Genesis album in 1997. Impossibly, not mentioned in the film. Genesis Archive box set (67-75) – great project that didn’t get any mention. Three Remaster Box Sets: 70-75, 76-82, 83-98 – all three dismissed. Collins’ 2007 accident on tour – reason for his inability to drum. Missing from final edit. Genesis Live 1973–2007 – another box-set that was thrown out of the film’s “plot”. Genesis Revisited II – even Hackett’s reworking of Genesis classics has been left out. Influence on other bands – a subject that didn’t appear anywhere. Marillion’s just one example. Tribute Bands – great groups such as The Musical Box and ReGenesis are missed here. Hall of Fame Induction – both Genesis & Gabriel. Not there in the film. Any short biography book, like “Genesis Inside & Out” (by Robin Platts) gives you a fuller and a truer picture of the band’s story, compared with BBC-2’s “Together and Apart”. Of course it’s better than VH1 short docu (44 mins. ), but it seems like too many important milestones and people were not even interviewed, because a 90-minute duration is just not enough to cover this epic journey. 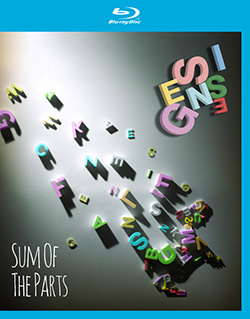 The DVD-BluRay edition, titled “Sum of its Parts”, has 30 minutes of extra footage, but it doesn’t showcase an expanded narrative or different interviewees. So, the jury is out and the rating is pretty low: 7/10 for “Genesis – Together and Apart”, a PR product to promote the “R-Kive” 3CD set. The real documentary on Genesis has not been produced yet. It would take much more work, and complete editorial freedom to include the darker stories of the band, the chapters untold in the BBC dry-cleaning effort, and a wider perspective on the band’s work on the rock, pop and prog-rock world. How could it be that returning after 35 years, one of the most gifted artists of our times feels the need to wow the audience with visual theatrics rather than play her wonderful songs? The news was so outrageous it seems something was wrong: could it be that Kate Bush has just announced a return to live performance, after so many years? Sure, there were some signs of that materializing – she has returned to album making, was seen in public accepting an award and also spoke of a possible return to the stage. But few seemed to have believed her. Kate Bush was famous for being a recluse, content on creating music while shying away from ever meeting a live audience. The ‘Before the Dawn’ concerts have thankfully shattered this conception. Unfortunately, they have also broke other perceptions, in a more disconcerting manner. Kate Bush did return to the stage, as we all know, working secretly for more than a year on a lavish and intricate stage production, together with some of the most talented people in theater, lightning and special effects. Dancers, singers and, of course, musicians were also part of the menu, as was one special teenager, Kate’s own son, Bertie, who has become a regular fixture in her albums since ‘Aerial’ (2005), almost a decade ago. The show might have never come into fruition without him, notes Bush, and indeed it is hard to miss his many roles in the concert – singing, dancing, playing various acting parts, etc. Young Bertie’s presence seems to be a plausible explanation for the show immature tendencies, yet when push comes to shove, given the artist in question has time and time again proved to be hands-on with regard to all aspects of her work, including semi hidden etching on her vinyl singles, it should be assumed that, for better or worse, the concerts are a reflection of Kate Bush’s own vision rather than anyone else, including her son. 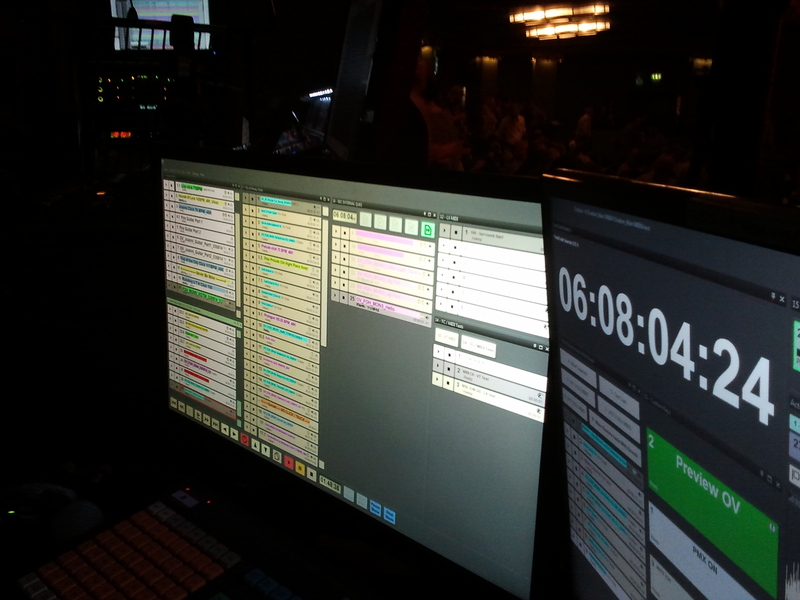 Yet the show was deeply upsetting for me as it seemed focused on visuals rather than sounds. 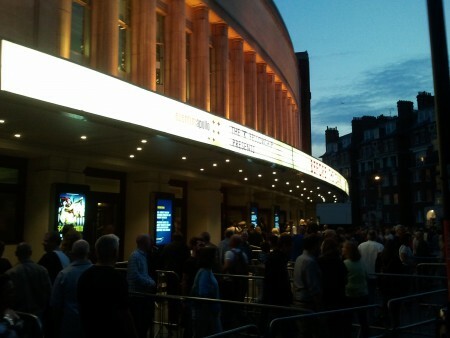 This has been a great disappointment for me, having spent thousands of pounds travelling with my children to the UK for the concert at the London Apollo. It was natural to assume we will witness some balance between what was important for Kate and what could be expected of her, i.e., singing some of her brilliant musical achievements of yesteryear but also as of late. Songs like ‘In a Coral Room’ or ‘Snowflake’, which are widely regarded among the peak of her work, are rather recent and therefore could have been included in a show which would suggest Bush is still very much a rare musical genius. However, while the inclusion of many of the ‘Hounds of Love’ songs, including ‘The Ninth Wave’ was expected, Bush has also added obscure songs under the heading ‘Hits’, some of which were never even released as singles, let alone attained popular following. It is possible to explain the omission of the earlier materials, some of which have been played live during the 1979 tour, but Bush decision to completely disregard more recent album such as ‘The Sensual World’ is a mystery. Well, at least somewhat of a mystery until one realizes ‘Never be Mine’, one of the most haunting songs ever recorded by Bush as to be included in the ‘Hits’ section, dropped, possibly at the last moment, due to the length of the show – three hours – one could assume. While this makes sense, in the context of having to shorten a very lengthy live concert, one which has been repeated almost every night during two months in the summer of 2014, the question still remains, why such a brilliant song, the only one from an entire album, was cut, rather than much less known and interesting songs. The concert’s final section, the second half of ‘Aerial’, ‘A Sky of Honey’, provided a possible key to understanding the Bush criterion for song selection – visual aspects of the performance seemed more important to her than the sound. While the musicians faded into the background, literally shoved into the far reaches of the giant stage, birds, huge canvasses, the sun and the moon as well as a myriad of other stage antics were introduces in a spellbinding manner, spinning the heads of all present and making sure the musical experience become a soundtrack to some of the most amazing images, such as a huge, slowly revolving, yellowish moon, which was as real as the dancers who shared the stage. For an artist who chose to transcend the need for tangible contact with the audience for so long, creating a show which included a selection of songs based on visual merit is unfortunate. I’m probably missing something. Most critics and members of the audience wrote favorably and enthusiastically about the concerts. Many wrote of the Clouds passing us from above, the giant trees crashing on stage, the troop of skeleton-skinned fish patrolling the stage, which become a sea in which Bush drowns during the Ninth Wave reincarnation. Yet few contemplated the fact that the choice of song could and should have been significantly different. Yet even more regretful was the heavy handed use of tapes and digital sounds rather than real musicians. A single violin player would have done wonders for the aural experience, while a small orchestra would have never been out of place given its extensive presence in the majority of Bush’s albums. Indeed, the songs renditions suffered, culminating in the abysmal omission of the counter melody in the show final song ‘Cloudbusting’. The audience seems content of just hearing the song. I wonder how many have noticed to lack of the delightful line played by the cellos on the album. What to make of all of this? Perhaps the fear of performing pushed Kate into making such a bigger than life experience, one in which Kate herself is dwarfed by the sheer magnitude of the experience. 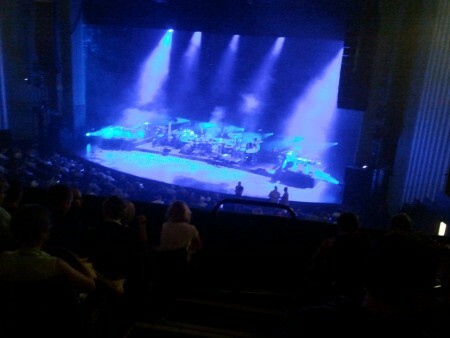 Kate Bush’s warm and wonderful voice is still very much there. It is still amazingly beautiful, lacking nothing, even if the range is a little more limited than before. Hence, she could have sung with ease most of the post 1985 songs. For many, including myself, Kate bush is the most brilliant female artist alive today. She is among the most gifted musicians of our time, disregarding gender. When she sings other people’s songs, it becomes clear that her voice is a rare gift: Elton John suggests Kate Bush contribution to Peter Gabriel’s ‘Don’t Give Up’ saved his life. Is there a bigger compliment? Unfortunately, much of her brilliance was lost on ‘Before the Dawn’.